한성백제 5백년과 조선왕조 6백년의 역사를 지니고 있는 서울은 많은 문화재와 역사문화자원을 간직하고 있다. 5대 궁궐과 조선왕조 역사가 누적된 도심뿐만 아니라 도시 전역이 역사문화의 장이라 할 정도로 선사시대부터 근대에 이르기까지 다양한 역사적 인물과 사건, 이야기, 보물 등이 숨겨져 있다. 2013년 현재 서울시에 있는 국가지정문화재 수는 880개로 이는 1965년의 146개와 비교하면 6배로 늘어난 것이다. 2013년 현재 국보는 157개, 보물은 572개, 사적은 67개소에 이르고 있다. 서울시 주요 문화재인 고궁의 관광객 수는 2012년 현재 7,980,757명으로 2005년의 배로 늘었다. Seoul boasts a plethora of cultural properties and historical resources, deriving its richness from its 500 years as capital of Baekje Kingdom and 600 years as capital of the Joseon Dynasty. Although the historical city center, with its 5 palaces and the historical sites of Joseon Dynasty, is best known in this regard, the entire city is a treasure trove of hidden stories and historical figures. 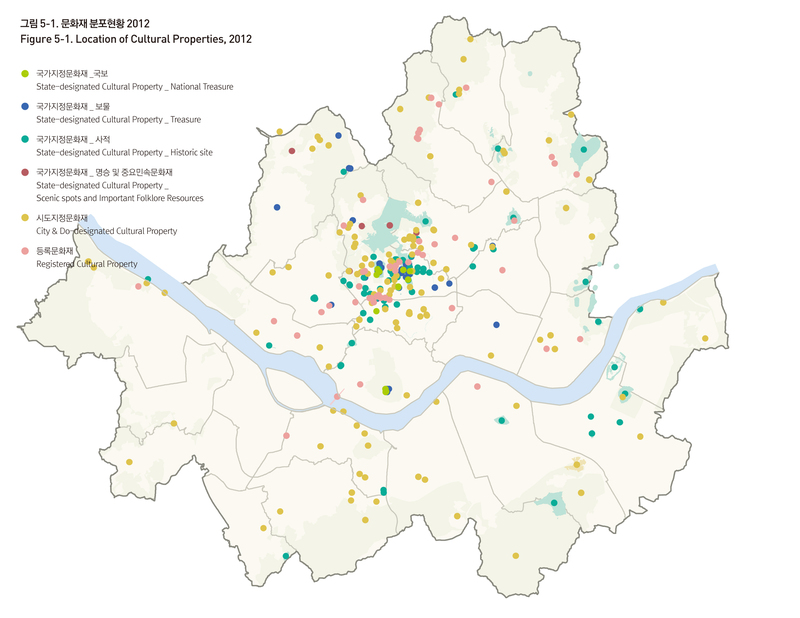 As of 2013, there are 880 state-designated treasures in Seoul, a six-fold increase since 1965. They include 157 national treasures, 572 treasures, and 67 historical sites. Approximately 7.98 million people visited the ancient palaces, one of Seoul's main cultural properties, which is double the number of visitors in 2005.